It is my (humble) belief that so much of our happiness derive from honesty, truth, clarity, simplicity and also acceptance of imperfections. Sometimes, we come across things that really captures these qualities in a tangible way. 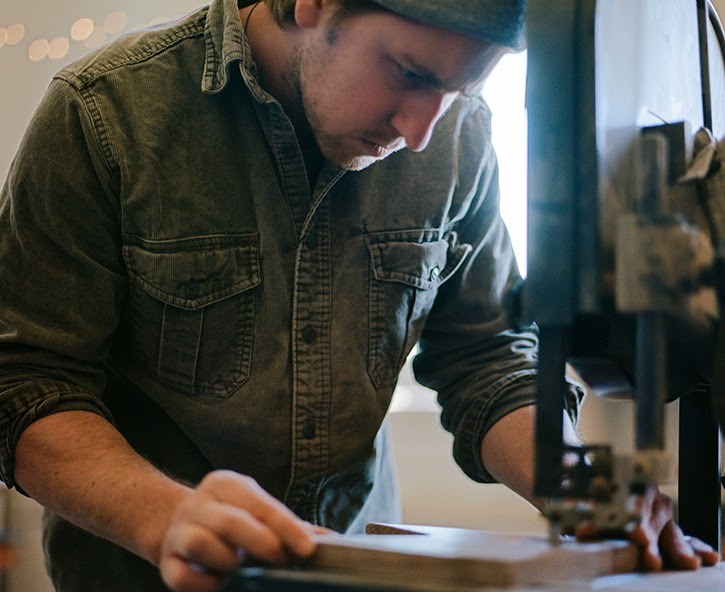 Today, we're excited to introduce Arbor and Brian-Christopher, an artisan behind Arbor's beautiful collection. 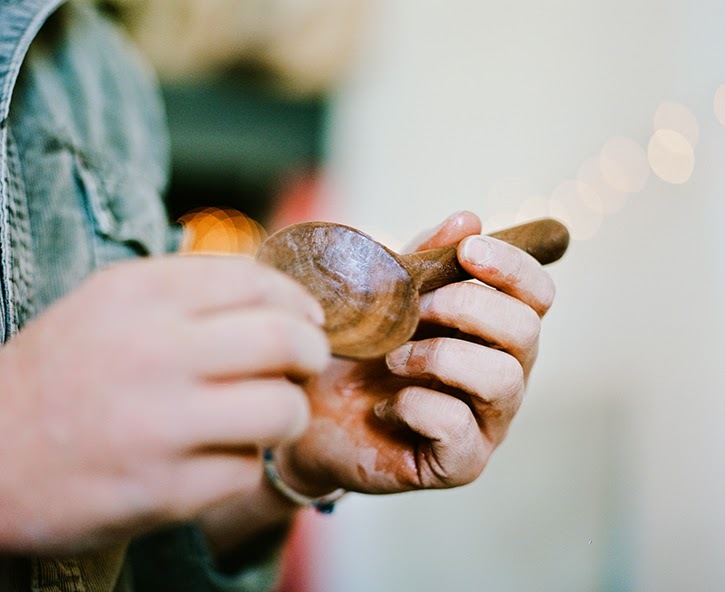 He creates simple, handmade artifacts and furniture that allow the natural beauty of the wood to speak for itself. We were captured by his beautiful work, but also the evolution of his journey that led him to Arbor. I had the pleasure of asking Brian-Christopher about his shop Arbor (www.arborshop.us), his inspirations, his process, etc. I hope you are inspired, just like we are! Angie: To begin with, can you tell us a little bit about your background? Brian: I grew up in a small suburb of Philadelphia about 30 minutes outside of the city. While it was neat to have easy access to the city, our house had acres of woods behind it where I spent hours climbing trees, building forts, and fishing in the creek. While in high school, I took nearly every art class I could, but it was athletics that led me to Johns Hopkins University in Baltimore where I studied Art History. After college I travelled a bit, lived in southern California, but ultimately found myself living in New York City and working in the contemporary art world. I always knew I wouldn’t make a career out of it but, like many people, I wasn’t really sure what my career would be. One day I began carving wood in my small New York apartment. I don’t think there’s one specific thing that triggered it, but probably a culmination of a lot of different things, from playing in the woods as a kid, growing up with a dad who is very handy, and always having my own urge to create. With most things I get into, I became VERY absorbed with it and began to learn and try to teach myself anything I could about working with wood. I still have a long way to go, and there’s always something new to learn, but our generation is so lucky in that there is so much free information online. "I like to create things that I think will help people create and tell the story of their home." Angie: What are some notable experiences that have influenced your thinking? Brian: Any time I’ve gotten to travel has been a notable experience that I draw upon. I think it’s so important to travel and see where and how other people live. I’ve been very fortunate to travel both abroad and within the US, and every trip always produces some new interest, idea, or way of looking at things. Most notable was my thru hike of the Appalachian Trail that I did after graduating college. That trip instilled a way of thought that influences my thinking on a daily basis. One step at a time! Angie: What is your overarching philosophy for Arbor? How is it manifested in your work? Brian: I make things for people’s homes. With how much time people spend in their homes, I really believe that it becomes an extension of their owner, and each object in that dwelling carries out its own part. So I like to create things that I think will help people create and tell the story of their home. To do so, I try and create works that are functional and not too overbearing in form that they fail to blend with the other objects and heirlooms. My aesthetic is to make pieces that are simple and authentic in form, but still carry out a sense of warmth. "Not everything needs to be replaced or fixed as soon as it develops a little scratch or discoloration. That’s how objects develop character and begin to tell a story." Angie: What do you want your customers to take away? What is the story you’re trying to tell? Brian: I feel that each piece tells its own story as the materials age with time and use. I hope that customers take away the idea that it’s okay for this to happen, and not everything needs to be replaced or fixed as soon as it develops a little scratch or discoloration. That’s how objects develop character and begin to tell a story. I think everyone could use a little more wabi-sabi in their life. Angie: What are some of your biggest inspirations for Arbor? Brian: Growing up, I spent a lot of time at my grandparent’s home that has always had some beautiful antique pieces in it. None of it is too ornate, but each piece has really taken on its own character with time. I think I developed an early appreciation for the way objects evolve or devolve, like the patina on a kitchen tabletop. I think that my experience working in the contemporary art world equally influences how I look at things. With everything I make, I‘m always trying to walk this fine line between the new and old, which can be a little tricky at times. Really any object that has a simplistic design is inspiration. George Nakashima’s work was important for me because it showed that you can strip down all the frivolousness and just allow the beauty of the materials at hand to speak for a piece. Angie: Tell me a little bit about your design process? How does inspiration transform into an artifact? Brian: With most of the smaller home ware objects, I really just try and find a design to best exemplify the beauty of the materials. Most of the objects are made with either Sycamore or Black Walnut; two woods with incredibly beautiful grain pattern. So sometimes just a simple shape is all that’s needed to create something interesting. With furniture, I really try and take a very utilitarian approach when designing something. Once I know what a piece is intended for, I’ll come up with a number of designs I think might work, and then I begin to pare things down so that the function of the object is always kept in mind. It can be difficult to make something that’s not too austere though. So while trying to walk the line of new and old, I’m also trying to walk this line of keeping something simple, but also trying to make it unique. "I try and disconnect as much as possible while working, but more importantly while I’m out and about. While I’m walking around I always make a point to be looking all around me and observing the people, architecture, nature, etc. It’s one way of drawing inspiration for me." Angie: As a small business, it’s important to be present online, but also be able to step away to have time to create and be inspired by what’s around us. How do you keep a healthy balance being offline & online? Brian: I think about the connectivity of our society quite often, and I undoubtedly owe a lot to it as I utilize social media everyday to share my works. For me, I try and disconnect as much as possible while working, but more importantly while I’m out and about. While I’m walking around I always make a point to be looking all around me and observing the people, architecture, nature, etc. It’s one way of drawing inspiration for me. I also make a strong effort to disconnect when I’m in a public or social setting, even if I’m just waiting alone for a coffee. I just think about some of the acquaintances I’ve made that way, which in turn have helped my business in some way or another – and it’s hard to experience that if you’re always on your phone. "Somewhere in the design process I always take a step back and evaluate if something really belongs or makes sense either in form or function. I try and apply this same process with my own life..."
Angie: How does Arbor parallel to your lifestyle/way of life? Brian: I’m always trying to simplify my work, especially with the furniture. Somewhere in the design process I always take a step back and evaluate if something really belongs or makes sense either in form or function. I try and apply this same process with my own life, but we all know that can be very difficult sometimes. Angie: There’s so much integrity in each of your handmade artifacts. A sense of purity and clarity in material and form language – why is this important to you? Brian: I think it’s becoming increasingly important for people to know where, and how things are made. People become more connected when they familiarize with the materials and know that it came from someone else’s hands and not a machine. For me, this means sometimes leaving slight imperfections such as a knot in the wood, which a machine can’t choose to do. When products get mass-produced you eliminate purity and clarity and everything just becomes the same repetitive object. Angie: How do you imagine Arbor growing? Where do you envision Arbor in 5 years? Brian: It’s already been such an unpredictable journey, so it’s hard to say where 5 years will leave me. From the beginning, I’ve always been very interested in making furniture, and I’m just now beginning to design and build a few pieces each month. I really look forward to developing a whole line of pieces and products that represent my aesthetic. 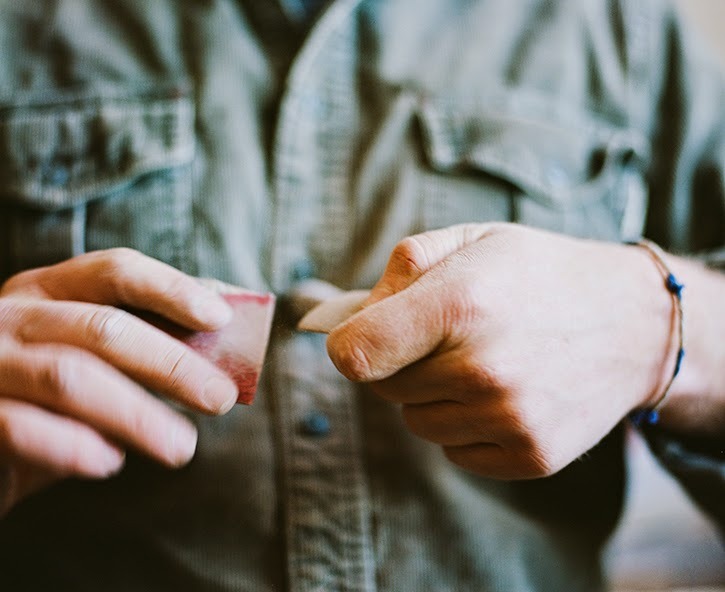 Though I always want to maintain the small batch essence, where the owner can still feel that connection with the maker and with the piece. "It’s very important that I find happiness with both the process and the finished good, because then I know it’s a true representation of myself." Angie: How much are you influenced by the environment vs. materials? Brian: I think it’s important to know the environment in which a piece will end up in, but I also try and make things with a sense of subtleness that allows them to be accepted into a number of different environments. It’s sort of the same approach with materials. If I have a beautiful piece of Walnut with a really intricate grain pattern, I’ll incorporate that into say a serving board, but I don’t necessarily try and make that the focal point. The same goes with furniture. A lot of furniture makers really strive to match up pieces of wood to both highlight certain features and create symmetry. I do this to an extent, but also try and welcome the randomness of certain boards being paired together. Again I’m walking this fine line, this time between organization and chaos. Angie: What does “finding happiness from within” mean to you and your work? Brian: I really only make things that I personally would take into my own home, and I just hope that others enjoy them too. I think unless you’re truly happy with your own work, it’s difficult to fully apply yourself to the things you’re making or doing. So it’s very important that I find happiness with both the process and the finished good, because then I know it’s a true representation of myself. Angie: Describe one of your favorite/ideal project & why? Brian: As my work evolves, I’d love to one day have a place to display it where people can come experience and interact with pieces before possibly taking them into their own home. Right now I have this dream or vision of all my work being in an old schoolhouse. So I think my ideal project would be to find an old schoolhouse up in the Hudson Valley, refurbish it, and turn it into my shop and show room. Crazy, I know. Angie: What is your favorite material to work with? Brian: I’ve really fallen in love with using White Oak, which I make all of my furniture out of. Using White Oak is partially influenced by the utility furniture that came of the UK during WWII because White Oak was so readily available even with wartime rationing. White Oak doesn’t have that initial rich beauty like you see in Black Walnut, but it really is a truly beautiful wood in a more subtle way. Angie: What is your favorite tool? Brian: Chisels. I love the hands on feeling when using them. You have a connectedness with the material that you lose when using a power tool. They also have such a diverse range of use that I always find myself using them in one way or another. Angie: What is your favorite part of the process? Brian: Finishing. I think I actually prefer that action of making and constructing a piece, but when finishing a piece you get to realize the fruition of your work and reflect on the entire process all the way back to simple sketch or idea. "I really enjoy watching the changes that occur in those seasons, both in nature and in people. It’s a healthy reminder of the circuitous nature of life. Those two seasons really suggest that everything around us is in a constant flux." Angie: What is your favorite season? Brian: I’m a bit biased with the time of writing this and want to say spring, but it’s really a tie between fall and spring. I really enjoy watching the changes that occur in those seasons, both in nature and in people. It’s a healthy reminder of the circuitous nature of life. Those two seasons really suggest that everything around us is in a constant flux. And I think it’s important for people to recognize that and try and mimic that in one way or another. Angie: What are Your favorite things – things that make you happy? Brian: Being around friends and family. Taking a good long walk in the woods. Enjoying good food and drink.